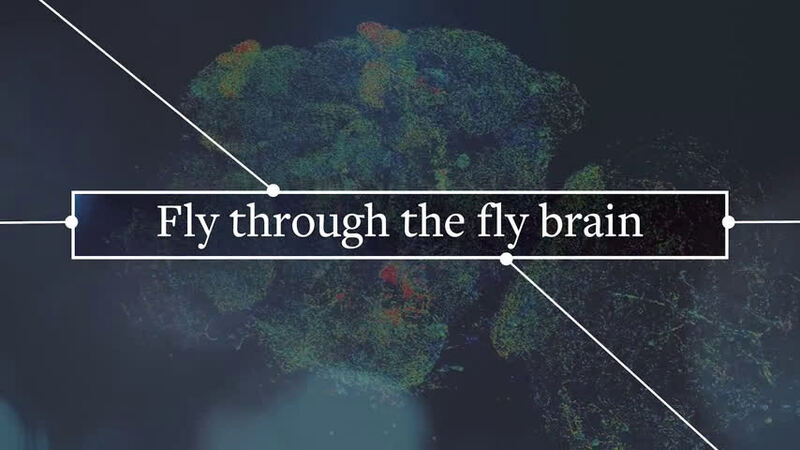 A new fly-through of the fly brain allows anyone to whizz past neurons and visit any of the 40 million synapses where neurons touch neuron. It's a super-resolution view of the complex network connections in the insect's brain that underlie behaviors ranging from feeding to mating. What's unprecedented, however, is that this 3-D map over the whole fly brain, which shows details as small as 60 nanometers across, was captured in less than three days. A fine-scale map of the complete neural network of the brain—the human brain but also that of the mouse and fly—has been a dream of neuroscientists for decades. 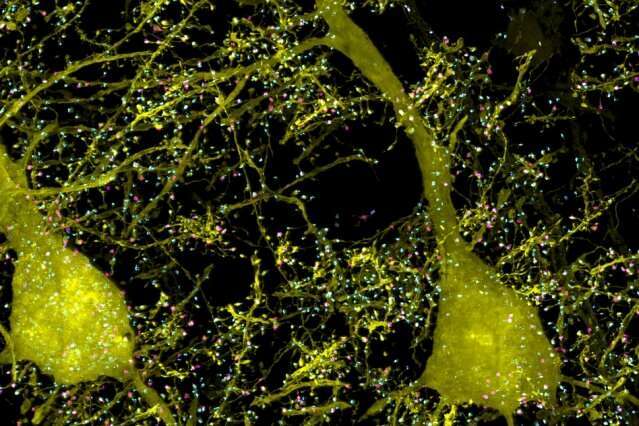 With it, they could trace the connections between neurons to understand how the brain makes decisions. 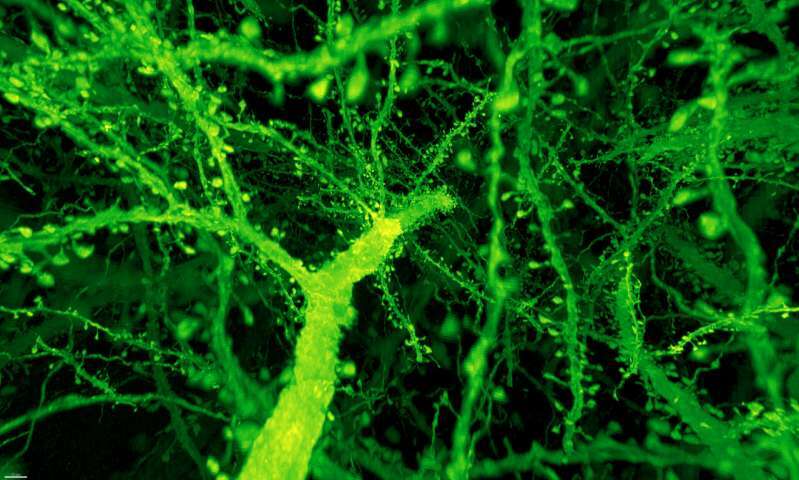 And by counting synapses, neuroscientists could judge the strength of neural connections, such as those responsible for memory. "You can spend years and years getting an EM image of one fly brain," said Nobel laureate Eric Betzig, who invented the lattice light-sheet microscope while at the Janelia Research Campus of the Howard Hughes Medical Institute and is now a professor of molecular and cell biology and of physics at the University of California, Berkeley. "I can see us getting to the point of imaging at least 10 fly brains per day." 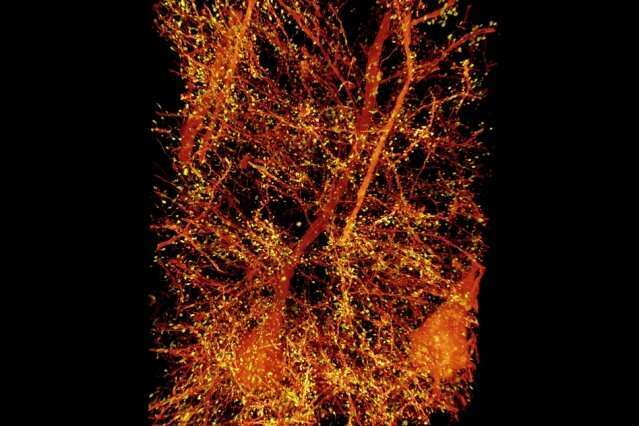 "We've crossed a threshold in imaging performance," said Edward Boyden of the Massachusetts Institute of Technology, who invented expansion microscopy five years ago. "That's why we're so excited. We're not just scanning incrementally more brain tissue, we're scanning entire brains." The new brain-scanning technique came about after Boyden asked Betzig's help in combining expansion microscopy with Betzig's latest high-speed imaging technique, lattice light-sheet microscopy. Expansion microscopy (ExM) involves fixing tissue and then expanding it like a balloon while keeping the relative positions of internal structures unchanged. It uses a polyacrylamide gel like that in diapers, which swells when moved from salty to pure water. Lattice light-sheet microscopy (LLSM) uses highly focused light beams to rapidly assemble a 3-D image of a specimen one thin slice at a time. "When they first came to me in 2016, I was still a skeptic; I was worried, first, whether you could expand anything like that and not have it be warped like crazy," Betzig said. "And then I was afraid that, while the samples are transparent, they would still warp the light like a bag of marbles." Working at the Janelia campus, the combined teams, led by postdocs Ruixuan Gao and Shoh Asano of Boyden's MIT lab and Srigokul Upadhyayula of Harvard Medical School, found that after expanding the brain tissue by a factor of four, to a volume 64 times normal, it was nearly as clear as water and unwarped. "I was shocked at how perfect was the clearing to make it incredibly optically uniform," he said. Betzig predicts, however, that with improvements in expansion microscopy—some scientists have stretched tissue 25 times in each direction—the combined techniques could achieve results nearly as good as EM in terms of mapping all the neural connections in the brain, a field known as connectomics. "If you could get it to work at 10 times or maybe 15 times expansion, you could probably put a lot of the EM out of business," he said. "It might be good enough to do the dense neural tracing EM can do but much much faster and cheaper. I think they need to watch their backs. It is not there yet, but in my opinion, the potential is there." Both microscope techniques involve labeling proteins in the tissue with fluorescent markers. In expansion microscopy, the tissue is then infused with the gel and the markers cross-linked to the gel structure. Then all the protein is digested away, leaving what Betzig terms a "fluorescent phantom." Changing the salt concentration of the media causes the gel to swell, dragging the markers with it. It becomes mostly water, which accounts for its clarity. 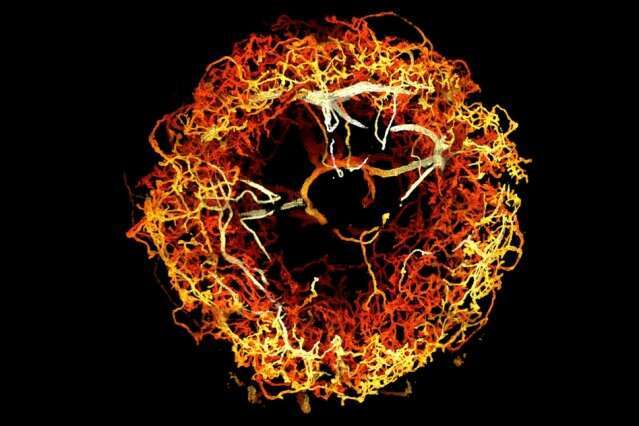 Each complete scan, amounting to nearly 10 terabytes of data, is then assembled by computer into a 3-D image that can be navigated like a video game. The time-intensive assembly was overseen by Janelia computer scientists Stefan Saalfeld and Igor Pisarev, and then analyzed and visualized by Upadhyayula, who will soon open a state-of-the-art imaging lab at UC Berkeley. There are limitations, however. As with any kind of super-resolution fluorescence microscopy, Betzig said, it can be hard to decorate proteins with enough fluorescent bulbs to see them clearly at high resolution. And since expansion microscopy requires many processing steps, there's still the potential for artifacts to be introduced. Because of this, he said, "we worked very hard to validate what we've done, and others would be well-advised to do the same."